The Construction Skills Certification Scheme (CSCS) is to withdraw the Construction Site Visitor Card, the only remaining card issued without the need for an applicant to achieve a recognised qualification. Originally introduced for workers who often did not perform a construction-related role but visited site on a regular basis, the card is being withdrawn in support of industry’s desire for a fully qualified workforce. All Construction Site Visitor Cards issued from 3 September 2018 will expire on 31 August 2020. CSCS will stop issuing the card altogether from 28 February 2020. For the avoidance of doubt, all Construction Site Visitor Cards issued before 3 September 2018 will remain valid until their expiry date. 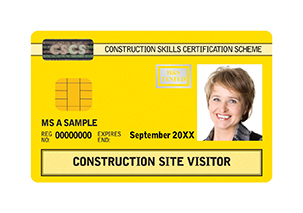 Many people holding the Construction Site Visitor card will not be required to obtain another CSCS card. CSCS cards are intended for construction related occupations only and many people holding the card work in roles considered to be non-construction related, such as site cleaning and catering staff. Historically these workers have applied for the Construction Site Visitor card because they were told to do so by their employer, this was often a result of policies requiring sites to be 100% carded, as opposed to construction workers being 100% qualified.